I spent Wednesday morning this week getting inspired by a group of lawyers. Not your usual experience of attorneys? Read on and take heart. ▪ Nate, who unknowingly selected a clueless lawyer to handle his disability appeal. He hasn’t heard from his ‘advocate’ in almost two years, and all of his phone calls go unreturned. He wonders if he dressed better and had more education if he would be treated this way. ▪Those entangled in the criminal system have hair-raising stories of being tossed through courts like pennies….worth something, but not much. ▪ There are frequent, long litanies of unmet legal needs. Many, many people have legal issues so ubiquitous and overwhelming that they simply concede defeat before even attempting to find a remedy, believing that there is no help for them, or it’s too exhausting, or expensive, or that access to justice is available only to the wealthy and to corporate interests. To these women and men, lawyers and the law are more hindrance than help. 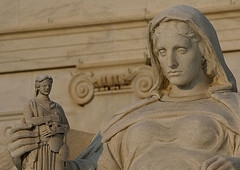 They need Lady Justice to take off her blindfold in order to see and remove some significant barriers before they can climb up onto those scales of justice. But this Wednesday morning was spent with lawyers who have taken off the blindfold, with Justice Embodied, the members of the Delivery of Legal Services Committee and public interest community of the Philadelphia Bar Association. Some of the most notable legal minds and hearts in the region have chosen to devote their considerable talents to representing and empowering poor and vulnerable people. In an extraordinary and nationally unprecedented collaboration, they have met for decades on the first Wednesday of every month to discuss and envision how they might do their already impressive work even better. The individual and collective efforts of this extraordinary group of lawyers have benefited people living on life’s edges in so many ways. They protect children from abuse, whether by their caregivers or the judiciary. They launch the healing of women’s lives through effective advocacy that frees and protects them from abusive relationships and other obstacles. They advocate for elders and for children, defend our eroded civil and human rights, prevent foreclosures, assist people who are homeless with a host of legal issues, accompany immigrants through a bewildering legal minefield, secure income, work, health care, and housing for countless individuals and families. Check out more of what these fine folks do. All of this is in addition to concerted, collaborative efforts to change those systems that create and perpetuate the conditions keeping people in grinding poverty. Their passionate dedication as individuals is tangible; their collective energy is potentially transformative. And they are working hard at discerning what shape that energy might take. So to those who have grown cynical and jaded about lawyers, take heart and hope from this. Times are tough, economically, socially, politically; it takes courage to be visionary when the practical, hard-headed impulse is to circle the wagons, tend our own gardens, focus on narrow self-interests. But here are attorneys who are trying to envision and give birth to an equitable and healed justice system, who are dedicated to changing the untenable status quo. Their passion for justice pervades their creative hearts and minds, directs the work of their hands, and informs the commitments of their lives. These are lawyers you can love. [i] Since she lost her home, the lawyers described above have partnered with the judiciary to provide effective relief to owners in danger of losing their homes. Thanks for providing a more comprehensive view. My father is a very fine and decent lawyer . It’s a shame to condemn an entire profession because of some sleazy elements.